My scionwood swaps this year are intended to expand our pear varieties in preparation for a planned high-density planting. To that end, I'll soon be receiving Shinko, Leona, Potomac, Maxine, Moonglow, and Blake's Pride scionwood, and I recently mailed out heirloom apple and pear scionwood to pay back my pear sources. I won't go into more details about swapping in this post because I've written previously about how to match yourself up with other scionwood swappers, along with the basics of how to turn your found scionwood into new trees. Suffice it to say that scionwood swapping is easy, cheap, and fun! When it comes to grafting that scionwood onto roostocks, though, pears can be trickier to graft than their appley cousins because some pear varieties aren't compatible with certain rootstocks (especially the quinces that used to be used as dwarfing rootstocks for pears). Luckily, the introduction of OHxF (Old Home x Farmington) rootstocks, which are in the same species as the European pear (Pyrus communis) while still providing some dwarfing characteristics, make the incompatability issue less pressing. Asian pears, on the other hand, are often grafted onto more vigorous rootstocks in the species Pyrus betulaefolia, but I'm hoping that my one Asian pear (Shinko) will do okay on OHxF 513 like the rest of my new trees. I know, I know --- too much plant geekery for certain readers. But I'll bet you'll enjoy the pretty pictures of pears dripping off our dwarf trees in a few years! Imagining the eventual fruits resulting from this year's swaps is how I lull myself to sleep on winter nights. deb --- Good question! I think your best bet is to wait for the pears to fruit since fruits are much easier to identify than non-fruiting trees. At that point, you'll also know whether you like the fruits or not --- I've found that the old-timey gritty pears aren't my thing and are better top-worked with a succulent modern variety. Either way, it's exciting to move onto a farm with mature fruit trees! Yep, it will be exciting to see what develops here. Three old apple trees, and two pears. I dont think the pears are so old, but the apples are pretty ancient. I hadnt thought of top working them... great idea! It will be a few years before they are all pruned down to a reasonable size. By then we will know whats good and whats not. We are planting some new trees also. thanks. I think you mentioned this in a previous post, but I took a quick peek in the archives and didn't find it--where do you get your rootstock from? Jake --- That's a good question! There don't seem to be all that many rootstock sources available at layman levels, and I don't necessarily recommend only one of them. I generally order rootstock from whichever nursery has the other plants I'm looking for that year. This year, I'm going with One Green World, although I had been hoping to get most of my rootstocks from our extension agent. 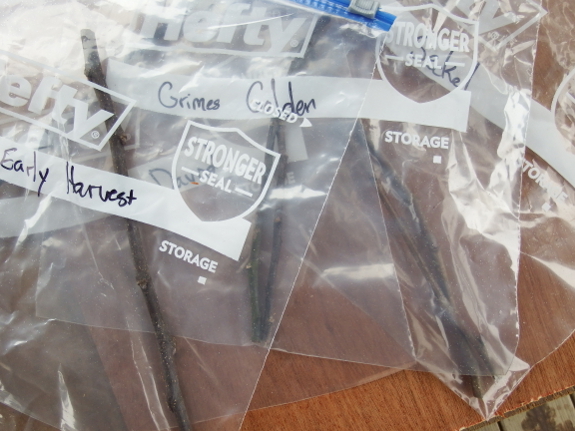 If you call an extension agent who's offering a grafting workshop soon enough to get in on their order, they can usually save you quite a bit --- ours charges $1 per rootstock rather than the $3 or $4 you'd pay online. But they were out of pear this year, so I had to order it. I'll look forward to hearing about your grafting experiments!